Downtown Ithaca offers a number of office space environments to meet the variety of needs of businesses, from compact, single office units to large spaces that can accommodate cubicles for call centers. Ground Floor: 2,100 SF of space. Features beautiful wall-to-wall windows and separate entrance to space. Utilities & building fees included (not electric). Ground Floor: 1247 SF of space. Great location for a restaurant. Presently operating as The Commons Kitchen Restaurant. 1,600 SF of dining and kitchen space. Additional 980 SF in basement for storage. Turn key fully-equipped and furnished. All equipment and furnishings convey with sale except hood system. Seats 45-50 inside with additional outdoor seating available on seasonal basis with City permit. Multiple restrooms. Offered at $130,000. Ground Floor: 585 sq ft cafe in the atrium. Available Space: 1,500 square feet each space. Description: Two high-end retail spaces on the first floor. Shared facility with Hilton Garden Inn, Starbucks, and Kilpatrick’s Publick House. Across from the Ithaca Commons and Seneca Parking Garage. Description: Two bars, theatrical stage with 5,000 square feet of hardwood floor, working fire place, 25′ ceilings, two dining rooms, and a commercial kitchen with hood. Neighbors Dewitt Mall and the Ithaca Commons. 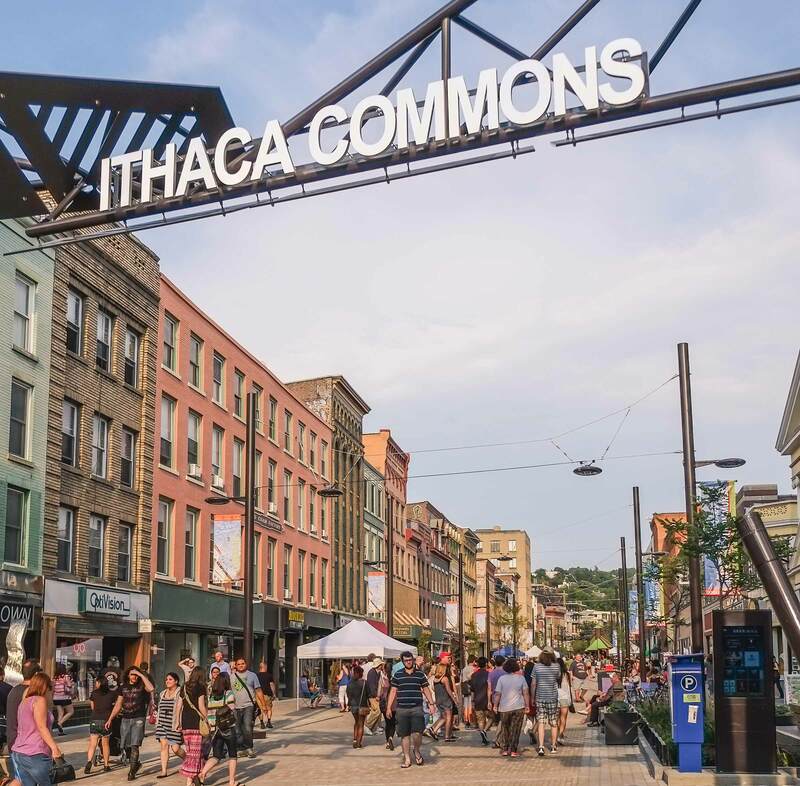 Description: Retail spaces are accessible from the Ithaca Commons promenade. Interior walls of properties are painted white. Available Space: Second floor property on the Ithaca Commons. A former salon, it is located above Exscape Smoke Shop. This new retail space will be the cornerstone of a to-be-built, modern, 12-story mixed-use building comprised of Prime Retail, Class A office, plus 108 apartments in the New Harold’s Square in the heart of Ithaca’s Downtown Business District on The Commons. Three storefront options available: 2,674 SF; 2,900 SF & 9,210 SF, where two of the stores have prime frontage on The Commons. Also adjacent to one of three Downtown Municipal Parking Garages. Large 2125 sq. ft. main-floor space consists of large open retail area plus two small, enclosed offices. Features: high, beamed ceiling and oak trim throughout. Large casement windows topped by leaded glass transoms extend along two walls, providing lots of natural daylight. A private walled outdoor terrace, raised about five feet above ground level, provides 800 sq. ft. of additional contiguous space. Renovations, which provided modern amenities while preserving original aesthetics, won “Award of Merit” from Historic Ithaca. One block to Ithaca Commons.